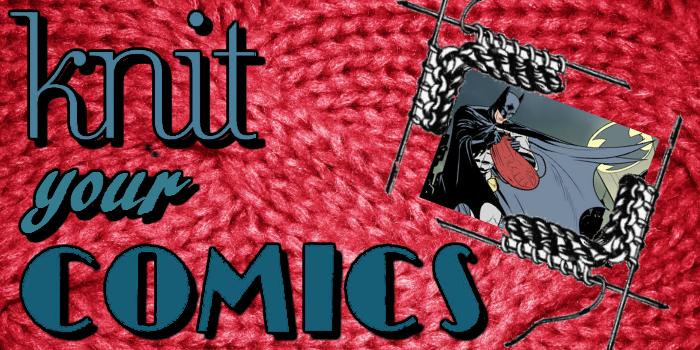 WWAC’s Free Comic Book Day Favorites! Free Comic Book Day! One of the best days of the year for comic book fans, FCBD is perfect for discovering new books, hooking little or novice fans, or getting to know your local comic community. (And, if you’re in my neck of the woods, getting a free shaved ice in honor of the day from the taco place under my LCS. Heck yeah!!) For 2018’s FCBD, our contributors wrote about their favorite free comics, which cover the gamut from Disney princesses to superheroes to international intrigue. 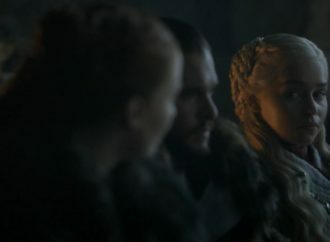 Read on, and remember: first one’s free, kid! It was pouring buckets on Free Comic Book Day, so I tried to make it to my LCS before the crowds. While I failed to sneak in just after the doors opened, I did enjoy threading the needle through roving gangs of young comic fans. 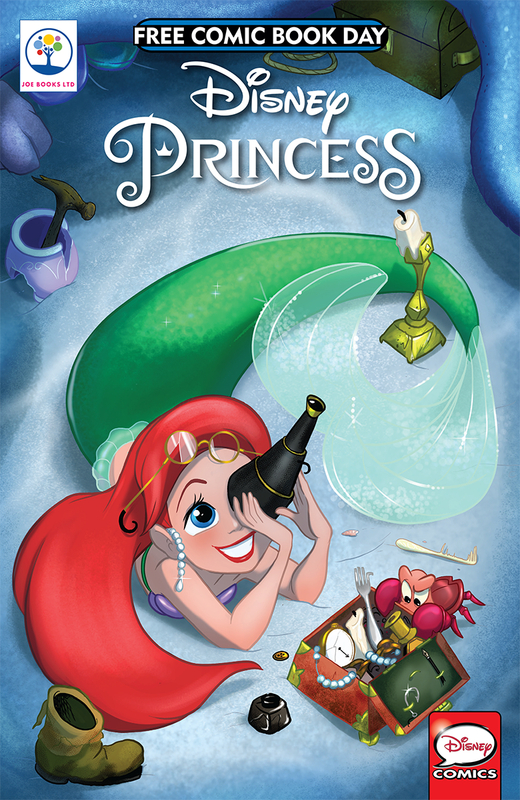 Disney Princess: Ariel, one of this year’s FCBD offerings, collects comic strips featuring many kids’ favorite mermaid. This is definitely the kind of comic I would have enjoyed when I was a member of the target audience. In true Disney style, every strip is littered with references back to the original movie (and much like Captain America, I got those references.). The strips vary in length from the typical quick-witted four panels you might see in the funny pages to more elaborate, multi-page setups. All a Little Mermaid fan’s favorite characters make an appearance: Sebastian the crab, Flounder, Scuttle, King Triton, Ariel’s sisters, Prince Eric, even Grimsby (Eric’s snobby butler). Well, almost everyone gets page time; for some reason, Ursula doesn’t grace a single page. 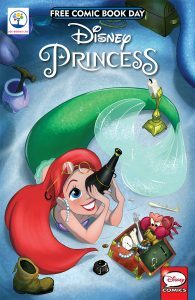 If you have a young Disney princess fan, especially an Ariel fan, at home, Disney Princess: Ariel might be a nice addition to the bookshelf. Just watch out for the puns; they’re dad joke level, and they’re inescapable. 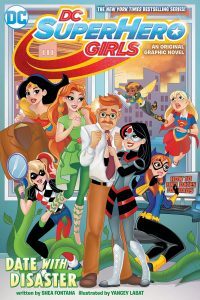 If you have a preteen at home who’s interested in superheroes, DC’s SuperHero Girls series makes an excellent stepping stone. Maybe they’ve hit up Tiny Titans but aren’t sure they want to move on to Teen Titans yet. A look at the teenage lives of the franchise’s biggest names might keep them hooked. 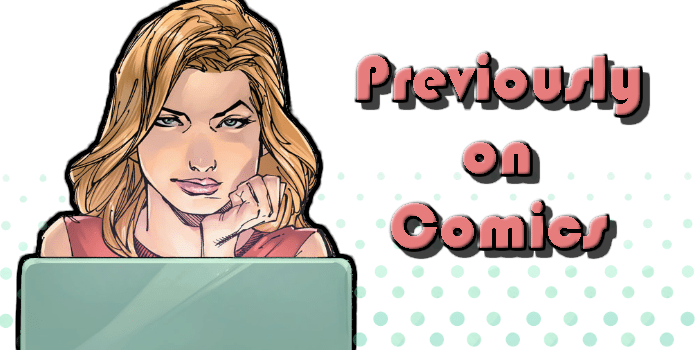 DC’s FCBD issue is a chapter from the forthcoming graphic novel Date with Disaster. Catwoman’s observation of a late-night explosion at STAR Labs draws Batgirl, Wonder Woman, Supergirl, Bumblebee, and Ivy (but emphatically NOT Harley) from the Super Hero High dorms. The details don’t add up to Babs’ trained eye, but the mayor is all too ready to sweep the incident under the rug. Teaming up with curious teen reporter Lois Lane, Batgirl is not about to stop until she finds the truth. The issue ends with brief introductions to all the superpowered femmes of Super Hero High. If you have a young Marvel fan you’re trying to coax to the dark side of DC, this is a great piece to try. It definitely left me hoping to get my hands on the full graphic novel. My FCBD began with standing outside the local comic book shop in what I (as a British person) would call sweltering heat (around 18°C), whilst a teenage girl behind me shouted “HAWKEYE IS IRRELEVANT!” at a Hawkeye cosplayer hired by the shop. I think she had some strong feelings about Infinity War. 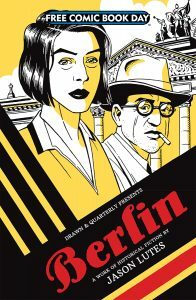 This FCBD comic is issue #1 of Lutes’ serialised graphic novel, Berlin, which first began in 1996 as part of a planned trilogy of graphic novels. 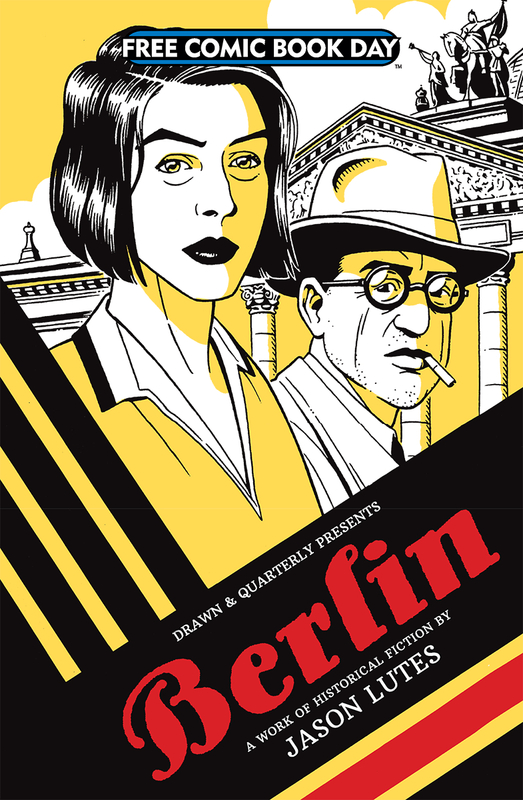 Berlin charts the declining years of the Weimar Republic in Germany, from 1928-33. In this issue, we meet Marthe, an artist arriving in Berlin for the first time, unable to grasp some of the city’s realities. On the train there, she meets Kurt, a weary journalist. Marthe bristles at Kurt’s brusque cynicism, but it is clear that these characters will form some kind of bond over time. It’s a fascinating insight into the dying days of the Weimar Republic; Lutes’ depicts not only believable characters, but also a society that recognises the creeping fascism taking hold, but seems unable to halt its progress. Stories like this will always be relevant, but even more so in the current political climate. 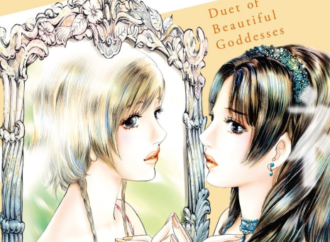 There is an interview with Lutes at the end of the comic, but avoid reading it if you’re planning to pick up the rest of the series as there are some mild spoilers included. 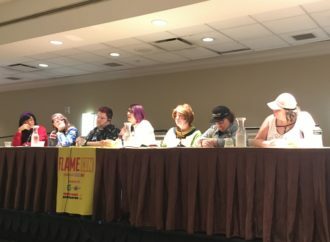 When Marvel Rising, Marvel’s answer to DC SuperHero Girls, was announced, it promised a diverse line up of some great second gen and new heroes, even pulling from Agents of SHIELD and including Quake. What was promising about the initial designs of these heroes was the glimmer of body diversity displayed — while we’re still pretty far from getting a fat heroine beyond Valiant’s Faith, Doreen Green has been rocking curves since her inception. Unfortunately that body diversity never made it past the promo images — in the comic, Squirrel Girl is slim-hipped and not round-faced at all. While Marco Failla’s art is cute and dynamic, the contrast between Helen Chen’s Doreen on the cover and his in the interior makes them hard to identify as the same character. 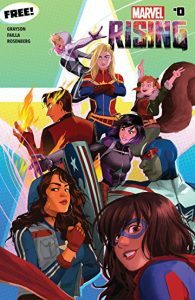 Beyond that, Marvel Rising #0 delivers a cute story about Ms. Marvel and Squirrel Girl teaming up during Kamala Khan’s field trip. I’m glad to see Devin Grayson back in her superhero wheelhouse at Marvel, but I’m a little concerned that the story looks like it might center a new Inhuman, Ember Cavanagh Quade, a girl at Kamala Khan’s school — I’m interested in this title so I can read about the already existing (and diverse) heroes! The issue itself was 28 pages, and exactly 13 of those pages contained the comic’s actual story. The rest had in-house ads for other teen and YA targeted books (including Saladin Ahmed and Christian Ward’s Black Bolt?). There’s also a several page excerpt of early reader book Super Hero Adventures: Buggin’ Out by MacKenzie Cadenhead and Sean Ryan. 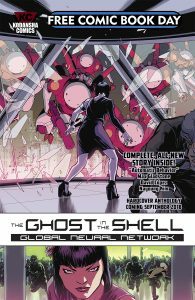 Kodansha’s upcoming Ghost in the Shell hardcover is an interesting experiment–it’s the Animatrix of GITS, a collection of short stories by creators other than Shirow Masamune, albeit under his guiding hand. These projects have existed elsewhere too, and they almost universally land a little flat–which isn’t necessarily a bad thing. Anthologies like this create a space where writers and artists can use the tools of a given sandbox and play around a little, try new things. They don’t always work, but it’s always interesting to see what choices are made, and how those choices are executed. This FCBD issue contains a story from that hardcover, entitled “Automatic Behavior.” I’m a little on the fence about it–the character work feels accurate enough, but the plot itself is…safe. It’s a single, contained adventure for the Major, with cameos by the Section Chief and Batou. She fights robots, there’s some optic camouflage, it’s very standard fare that ends up feeling a little boring when inserted into a plot about how people are unable to change their ways. 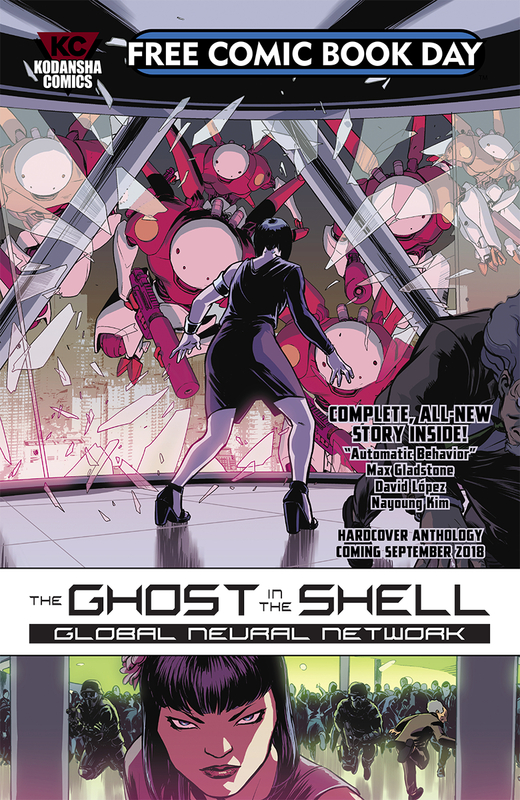 It’s like a commentary on GITS itself, whether intentional or not: This is what you get. The art is mostly great–I’m familiar with Lopez going back to his runs on Captain Marvel, so it’s nice to see him exploring something that’s a little darker. In fact, I only have one complaint: I don’t like the way he draws Batou. Nayoung Kim’s colors are moody and manage to cover the spectrum despite so much of the story taking place in dark spaces; Jodi Wynne’s lettering has those hard noirish angles that lend themselves well to the mood. All in all, a pretty story, if not a moving one. DC did something different this year for Free Comic Book Day. While they still had their free offering (DC SuperHero Girls: Date with Disaster, reviewed by Laura, above), they also released a 25¢ book the week before FCBD. DC Nation #0 is a lead in to the three major DC events of the summer: Batman and Catwoman’s wedding, Bendis’s Man of Steel, and Justice League: No Justice. 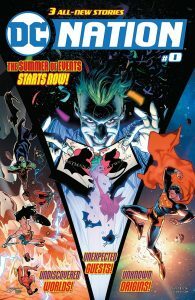 Many shops gave DC Nation #0 away for free on FCBD, but all shops were allowed to sell it for a quarter this past Wednesday. Oddly, while I am rather ambivalent on his Batman run as a whole, I really enjoyed Tom King’s Joker story in this book. Leading with that dark of a story was a bold choice, and cements this as one of those FCBD books that you don’t give to a youngin’. King wrote a fantastically creepy and terrifying Joker. This is Bendis’s second Superman story, and lord I hope he gets better. I will say that Garcia-Lopez’s art works a lot better for Bendis’s storytelling than Jim Lee’s did. But the direction Bendis seems to be going is scaring the hell out of me. Lois is nowhere to be found, and is apparently missing. I swear to god if Bendis ends the marriage I will lose it. The No Justice story basically gives us a primer of what to expect from that weekly event (starting this Wednesday!). We get to see the four very bizarre Justice League teams, and see a bit of who’s left on Earth (SUPERGIRL!) while the others are off fighting universe devouring titans. 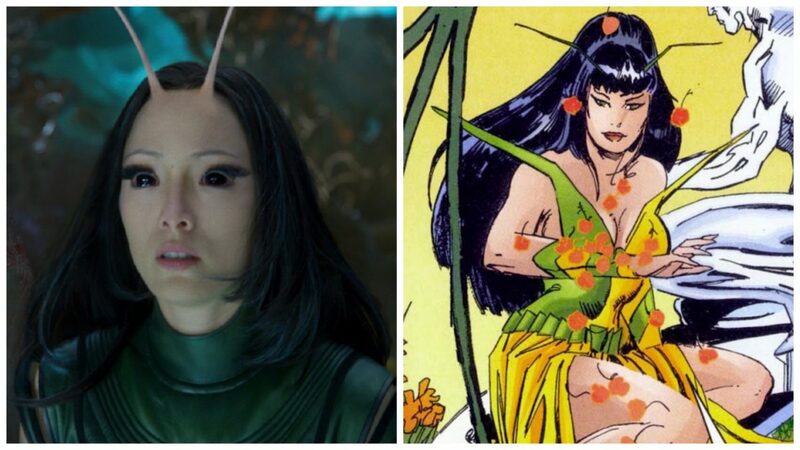 I get a bit of a Galactus vibe from the villains, but I look forward to seeing this play out. 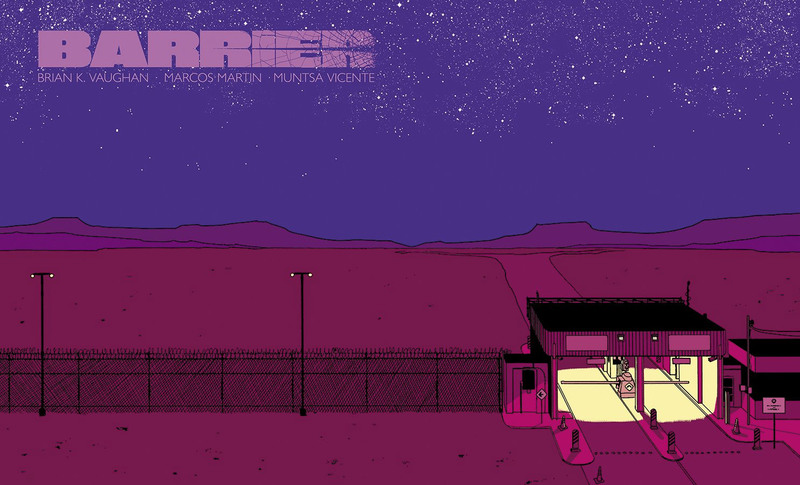 Unlike the usual FCBD teaser titles, Barrier is an already-completed short run story. The catch? 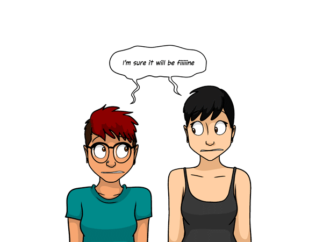 It was released in webcomic form starting in 2015 and the title has racked up a 2018 Eisner nomination for Best Digital. When I picked up Barrier from the FCBD table, I had no idea about any of this. The monochromatic purple cover and the promise of a free BKV story was enough for me; I love that his stories have a real-world soft political feel that may or may not have a sci-fi bent. Barrier doesn’t disappoint. The story follows a Texan rancher and an immigrant trying to cross the border illegally. It’s meaty for a free issue, but it never feels like it’s preaching. Be prepared for the dual language twist a landscape page orientation that throws the reader slightly off center but evokes a sense of the big western sky. I appreciate that the title applies to so much more than the story of what gets lost in translation – barrier of comics pricing (the digital version is pay what you can/want), the art constraints of portrait-style art pages in comics, the limitations of print comics for people with no local comic shop access or differently-abled readers, and the hand tying of storytelling in traditional comics publishing. I’ll be looking for the limited-time print run out this May in comic shops. 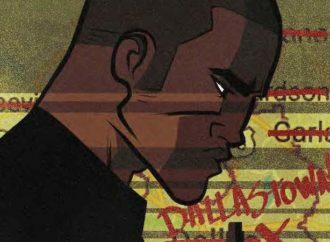 The title is also available digitally from Panel Syndicate. As Cartoon Network’s beloved Adventure Time animated series winds down its final season, this year’s Free Comic Book Day issue is a sweet reminder of the series’ fantastical appeal. This year’s special centers on fan-favorites Fionna and Cake as they complete their quest to deliver a punch bowl to Prince Gumball’s Semi-Annual Punch Parade, and bump into beasties and boulders along the way. Kiernan Sjursen-Lien’s script is a sweet, straightforward adventure story that’s thankfully complete in itself, rather than ending with a “buy this other book!” cliffhanger that can feel a little cynical in books aimed at younger readers. (And there are certainly plenty of ads for other BOOM! books at the back of the issue!) In an especially cute twist, Cake writes her own Fionna and Cake fanfiction. Of course, in-universe Fionna and Cake are themselves “rule 63” fanfiction versions of series leads Finn and Jake; however, Cake’s AU counterparts aren’t our familiar heroes, but a totally different boy hero and his shapeshifting racoon, whom I’ll call, uh, Fred and…Bake. The comic is quite cute, and Christine Larsen’s artwork is full of adorable designs like little green mushroom people and, my personal favorite, a beautifully original three-winged sphinx who challenges our heroes on a bridge. 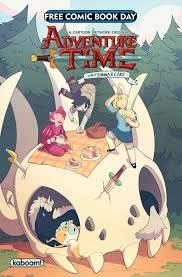 Fionna and Cake is perfectly whimsical all-ages fare, and if Adventure Time must end soon, I hope the delightful spin-off comics continue for years to come.